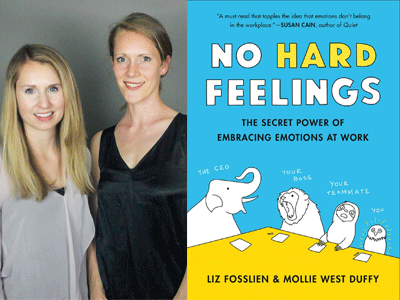 Strategy and design consultant Liz Fosslien and organizational designer Mollie West Duffy discuss their essential and hilarious collaborative work, No Hard Feelings: The Secret Power of Embracing Emotions at Work. A hilarious guide to effectively expressing your emotions at the office, finding fulfillment, and defining work-life balance on your own terms. How do you stop the office grouch from ruining your day? How do you enjoy a vacation without obsessing about the unanswered emails in your inbox? If you're a boss, what should you do when your new, eager hire wants to follow you on Instagram? The modern workplace can be an emotional minefield, filled with confusing power structures and unwritten rules. We're expected to be authentic, but not too authentic. Professional, but not stiff. Friendly, but not an oversharer. Easier said than done! As both organizational consultants and regular people, we know what it's like to experience uncomfortable emotions at work - everything from mild jealousy and insecurity to panic and rage. Ignoring or suppressing what you feel hurts your health and productivity -- but so does letting your emotions run wild. * Be selectively vulnerable Be honest about how you feel, but don't burden others with your deepest problems. * Remember that your feelings aren't facts What we say isn't always what we mean. In times of conflict and miscommunication, try to talk about your emotions without getting emotional. * Be less passionate about your job Taking a chill pill can actually make you healthier and more focused. Drawing on what we've learned from behavioral economics, psychology, and our own experiences at countless organizations, we'll show you how to bring your best self (and your whole self) to work every day.